Today I am here with another El Corazon polish collection. 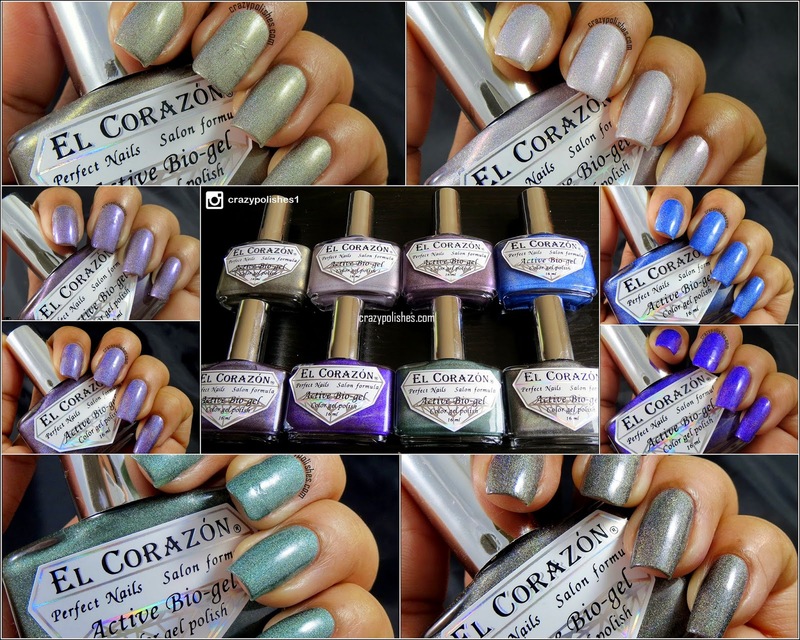 Its no secret that I like El Corazon polishes, they are great formulas, stays well and this collection is no exception. Prisma collection has total twenty polishes which got released over the period of few months. I have eight of them to show you today. Prisma polishes are scattered holographic polishes with a hint of duo chrome effect. Most of the polishes i swatched needed only one coat, so I am wondering if they stamp well too but if they do than it gonna need whole another post. I applied 2 coats of the polishes and didnt apply any top coat for these swatches. All the pics are taken indoor as weather here is very cloudy. The effect is more deeper and visible in person, I recently changed lightbulbs of the lamps and these bulbs are way too brighter. Apologies for that and you can check here to see more swatches. Prisma 423/21 is bronze color with hints of silver. Prisma 423/22 is white-ish silver polish with lavender duo chrome shimmer. Its pretty visible in the bottle but sadly isn't the visible on nails; nonetheless the shade is beautiful. Prisma 423/23 is purple shade with subtle lilac sheen. It is very close to 423/27. Prisma 423/26 is blue scattered holographic polish. Prisma 423/27 is another version of shade 423/23 with more silver tone. Prisma 423/28 is purple scattered holographic polish. Darkest shade of this bunch and certainly beautiful. Its looking more blue in the pics but it is those kinda purple which aren't easy to capture. Prisma 423/29 is green scattered holo polish. Finally Prisma 423/30 is dark grey scattered holographic polish.